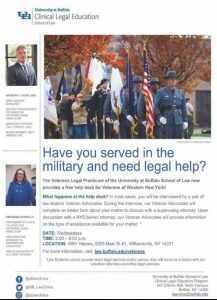 Each Wednesday from 2-6pm the UB School of Law Veterans Legal Practicum will be staffing a help desk at WNYHeroes in Williamsville. We are extremely excited to. You can also call our office to speak with them at 716-630-5020 or walk in.